Journey time evaluations serve as a tool for improving traffic situations. 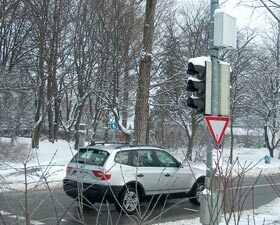 Compared to other methods journey time measurements of individual vehicles are much more accurate, especially when it comes to longer road sections as well as routes with several traffic junctions in-between. The V-REX JOURNEY TIME system is based on journey time measurement of individal vehicles and therefor can be effectively used for measuring the time along a specific road section within the innercity road network. This information can be used to evaluate traffic distribution within the road network and the impact on alternative routes between start and destination. The system consists of at least two V-REX systems with video trigger, mounted at beginning and end of considered route. All vehicle's number plates are time/location stamped, encrypted for privacy reasons and transmitted via CAT's integrated GPRS module to the IP-Server where all data are processed and current journey time is evaluated. Possible interferences within the GPRS network are compensated with the help of a multi-level fault tolerance concept. 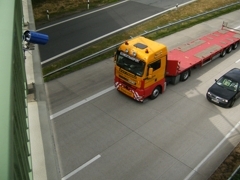 The system has proven its reliability while successful operating since many years on motorways and urban roads in Germany and abroad.